- Helped lead Shadow Hills (Calif.) HS to the playoffs for a second straight season in 2012, hitting .426 (29-for-68) with 5 homers and 27 RBI in 19 games. - Was born in Ohio, but has lived in North Carolina, Florida and California. - As a fifth-year senior in 2012, hit .340/.396/.449 (84-for-247) with 16 doubles, 1 triple, 3 HR and 42 RBI. - Was an Honorable Mention All-American in 2011 at Embry-Riddle University (Fla.) and was named first team All-Conference after he led the team in RBI (63), total bases (143), slugging percentage (.598), doubles (22) and home runs (9). - Played previously at University of Nebraska (2009-10) and was named to the Big 12 Commissioner’s Honor Roll in 2008. - Attended Omaha Central (Neb.) HS where he was named Nebraska’s Player of the Year and was tabbed as a First Team All-District V selection by the Nation High School Baseball Coaches Association. - Selected to play in the 2006 USA Baseball Tournament of Stars. - Went 2-1 with a 2.48 ERA (36.1-IP, 10-ER) in 10 apps (7 starts) in his first year with Lewis & Clark College. - Attended Green River Community College for two seasons and earned Second Team All-League honors as a sophomore with a 1.69 ERA and 92 SO in 57 innings. - His uncle, Brian Raynes, played in the Detroit Tigers organization. - Is the second player drafted by the Rays out of Lewis & Clark State College (also Matthew Stabelfeld in the 41st round in 2009). - Posted a 9-3 record with a 3.09 (32-ER/93.1-IP) as a senior in 2012. - Named to the All-Sun Belt First Team after he ranked fourth in the conference in ERA, third in opponents batting average, fifth in IP and SO and tied for first in wins. - Attended J.W. 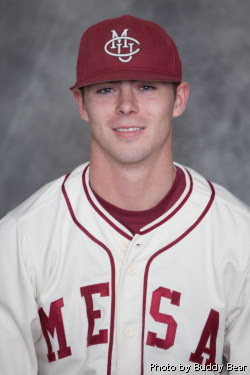 Mitchell High School in New Port Richey, FL, and was born in Clearwater, Fla.
- Spent his first and only season at Colorado Mesa University in 2012. - Pitched for Abilene Christian University in 2011. - Attended Wenatchee Valley Community College for two seasons (2009-10). - Previously drafted in the 35th round of the 2010 June Draft by the Kansas City Royals. - Relief pitchers Sergio Romo and Brendan Donnelly both attended Colorado Mesa University when it was known as Mesa State College. - Missed the majority of his 2012 freshman season at Panola College due to injury, but hit .291 with 5 doubles and 1 home run. - Previously selected in the 16th round in the 2011 June Draft by the Rays (No. 510 overall). - During his sophomore year of high school, was 1 of 40 players chosen by the Texas High School Baseball Coaches Association to play in the Sun Belt Games. - Selected to the East Region Division II All-East Second Team by the American Baseball Coaches Association, and selected participate for the Division II-III team in the 38th annual New England Intercollegiate Baseball Association All-Star Game. - Three-time All-Northest-10 Conference honoree, including a First Team selection in 2012, going 8-3 with a 2.26 ERA and 78 SO in 79.2 innings, and became just the second pitcher in Bentley history to win eight games in a season. - In three seasons for Bentley University, is the Falcons all-time leader with 21 wins, 229 strikeouts and a 2.81 ERA. - Missed the 2011 surgery following Tommy John surgery. - Did not play baseball during his first year at Bentley, is currently a graduate student pursuing his master’s degree after earning a BS in finance. 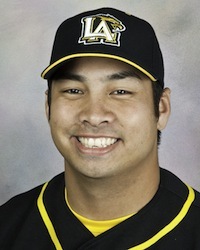 - Hit .361/.409/.525 (22-for-61) with 4 doubles, 2 HR and 8 RBI in 24 games (20 starts) for Cal State – Los Angeles in 2012. - Named Second Team All-California Collegiate Athletic Association honors in 2011 as a junior. - Played previously at Brigham Young University (2008-09). - As a senior at Northwestern, ranked second on the team with a .291 batting average (48-for-165) and threw out 41 percent of baserunners attempting to steal. - Named to the watch list for the Johnny Bench Award, given to the nation’s top catcher, prior to the 2012 season. - Named Academic All-Big Ten in his junior and senior seasons. - As a junior in high school, threw a no-hitter in a state semifinal victory en route to winning the Class 2A state championship. - Is the Rays ever first draft pick out of Northwestern. - Posted a 2-0 record with a 1.15 ERA (2-ER/15.2-IP) in 2012. - Previously drafted by the Rangers in the 29th round of the 2011 June Draft and the Reds in the 37th round of the 2010 June Draft. Brett McAfee again! Very interesting. I liked the pick last year. Don't know what happened in between, but maybe worth a try? Gonzalez was coming off his freshman year at GCC, but for Nacapoy, who finished up his senior year at Cal State L.A. in the spring, there was no going back. The former Falcon said he was contemplating a free-agent route to the big leagues or an independent league stint before he finally got the news from Cal State L.A. teammate Daniel Duran that he had been taken with just two rounds left to go. "I was getting nervous. ...[Duran] said look at the draft board and right when I looked was when my name popped up," said Nacapoy, a catcher, who batted .361 with two home runs and eight runs batted in in 24 games this season. "It was surreal. I had to stare at it to make sure it was me." Nacapoy said the Rays' area scout had brought him in for a workout recently at Cal Poly Pomona. Nacapoy said he's now waiting for a call from the Rays to find out where his journey to the pros will begin. "They were interested in me and said since I was a senior I would probably go in the later rounds," Nacapoy said of his communications with Tampa Bay prior to the draft. "I told them, 'Just take me and I'll go, just give me an opportunity and I'll take it.'" It's the second straight year McAfee has been selected. McAfee missed a much of last season at Panola College, but still signed with Arkansas. Garton had scouts tell him to expect to be taken during rounds 10-15, and when all those passed, he was "irritated," especially when he went through rounds 20-30 and received no phone call. "I knew I just had to keep my head up," Garton said. "It was the longest three days of my life, but when I finally did get the call, I flipped out." Garton just wrapped up a four-year collegiate career at Florida Atlantic, including this past season as the team's ace. Garton went 9-3 with a team-best 3.09 ERA and 84 strikeouts, and for his career he was 21-11 and had 226 strikeouts. Now, the Rays area scout will bring a contract for Garton to sign, then it's off to Port Charlotte for some work this weekend. After that, he will report to either the Gulf Coast League Rays in Port Charlotte or Princeton (W.Va.) Rays, the two state-side rookie teams for Tampa Bay. 40 - Sawyer is committed to the University of Oregon, if he doesn't sign. Ward now will have to choose between jumping into the professional ranks immediately or playing college ball, as he has committed to Fresno State. He had contact with the Diamondbacks in the seventh round of the draft, however, the two were unable to come to terms, he said.